When I received this question a few months ago on my Instagram account, I went right to work answering it as I went through a typical scenario in my head. At the same time, my friend, CN Alec White, a current US Navy Ceremonial Guardsman assigned to the Casket Team, gave a different answer from a different point of view. A different context is what we were both thinking, even though both of our answers were correct. Having the Officer in Charge of the US Coast Guard Ceremonial Honor Guard weight-in brought a complete answer for the question and everything worked out. So, I thought I would present a full answer here for future reference. No matter the title, each military service pallbearer team has specific protocols for their job. This also applies to first responder teams as well. While no two ceremonies are exactly the same, constant practice enables the team to adapt and overcome with minutes of notification- or less. The Casket Bearers of the Navy’s Ceremonial Guard move Sen. McCain’s casket from the chapel at the US Naval Academy onto the Old Guard’s caisson. First Responders: Here Are Some Scenarios. The remains have been transported from the site to the morgue. All of the pallbearers are in duty uniform and may be part of the department honor guard or not. Depending on your location and your job, duty uniform may not require a cover. The uniform for the informal movement of the remains does not matter. Location: In the northeast of the United states, most law enforcement duty uniforms include a cover. Job: Many sheriff’s deputies are required to wear one of a couple of different covers in duty uniform. Transport of the remains from the morgue to the funeral home (if required) can sometimes be a little more formal. However, the uniform may not matter, unless the family is there. The family’s presence dictates how formal and precise movement should be. Interment Day. Place covers before advancing to retrieve the remains (casket or urn). Once at the chapel where the service will take place (could be the funeral home or another location), wear covers to place the casket/urn. Not staying for the service: the covered (wearing hats) pallbearers move the flag-draped casket is in place and depart to out of sight of the family while remaining covered. At the designated time, form up out of sight of the family, place your covers, and move to retrieve the remains for transport to the grave site. Staying for the service: move to your seats (to the left of the family), sit as one unit, and then remove your covers. At the designated time and moving as one unit, replace your covers, stand up, and move to retrieve the remains for transport to the grave site. Placing a casket when the aisle is too narrow or the remains and casket are too heavy. In the case of the deceased being considerably overweight and having a heavy casket (in some cases you could be carrying 1500 lbs or more), the pallbearers may need the assistance of a bier/church truck to move the casket. Placement on the bier can take place upon removal from the coach/apparatus, or on arrival at the doorway of the chapel. The casket must also be set on a bier and pushed into place by two pallbearers when the aisle is too narrow for all of the pallbearers to carry the casket and set it into place. For this instance, all pallbearers bring in the casket, set it on the bier, remove covers, and step back. The pallbearers designated as Head and Foot, hand off their covers to the person next to them and bring the remains down the isle feet-first with Head pushing and Foot guiding. Once in position, if the flag is dressed (ends folded up), Head and Foot fix the flag so that it properly drapes all around and depart. On the way out, Head and Foot retrieve the remains the back of the chapel, dress the flag, step back into place, person next to them returns their cover, moving as one unit the team members place their covers, and carry the remains out to the coach/apparatus. Many thanks to my friends, Coast Guard LT Brandon Earhart and Navy CN Alec White for their input and of course their service to our country not only in their respective branch, but also for stepping up to render honors in the National Capital Region and beyond. That will be what the bugle call Taps is called when a proposal that is now in the House eventually passes. Read the complete story here. See also Taps 150 and TapsBugler. -When Taps is sounded in the evening as the final call of the day at military bases, salutes are not required. No, it’s not the infamous story of a son fund on a battlefield during the civil war, read this excerpt for the true and complete story of Taps. Give a listen to one of our great Americans, John Wayne, as he briefly and thoughtfully explains Taps. Apparently, some of my fellow Americans are completely unaware that the Flag Code states that the flag will be raised to full truck from half staff the day after a certain government official’s death. The time is different for different officials. Read US Code Title 4, Chapter 1, The Flag Code, here. Sen. McCain received his honors as far as the flag flying at half staff is concerned. Read about the difference in Formal and Informal Casket Watch here. Here are some DrillMaster Casket Watch procedure videos to help you to get a better understanding. How an individual died should not reflect on the honors received (suicide). This is different from a Line of Duty Death vs. off-duty or retiree. From my book, The Honor Guard Manual. To many in the honor guard world the term casket watch, is unknown. That is unless you are on an LEO, firefighter, or EMS honor guard. These members have known of and performed a casket watch for many years for their fallen. Let’s get into what casket watch is and how it is performed. The minimum for a casket watch is one guard who can informally or formally post at the head of the casket. If selected as part of the funeral protocol, two unarmed (armed with a rifle/shotgun/axe is considered inappropriate inside a chapel) honor guard members watch over the casket of the fallen during the viewing or wake. In most cases these members take their positions at the foot and head of the casket at Attention/Stand at Ease. Depending on the duration of the viewing or wake, watch shifts established. 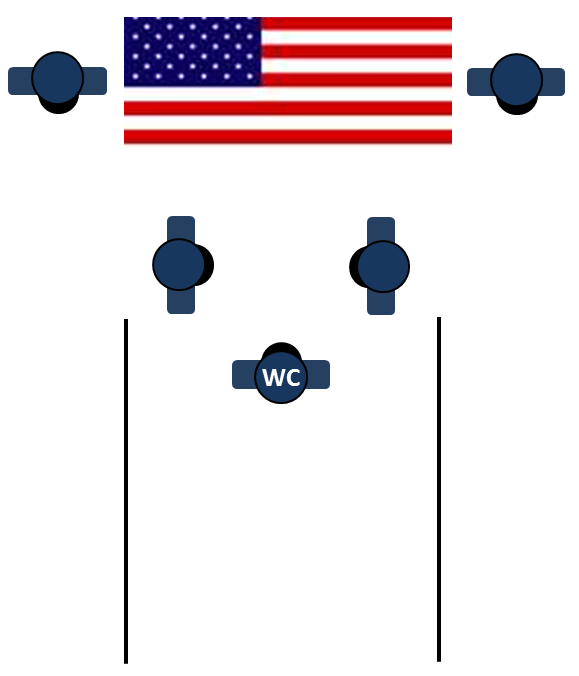 If a WC is not present, either of the watch guards will call subdued commands. The Watch Guards and the Watch Commander enter the room and form up at the back of the chapel at Attention. The WC gives the subdued command, Step, and all three members begin marching toward the casket at Slow Time (60-90 steps per minute). 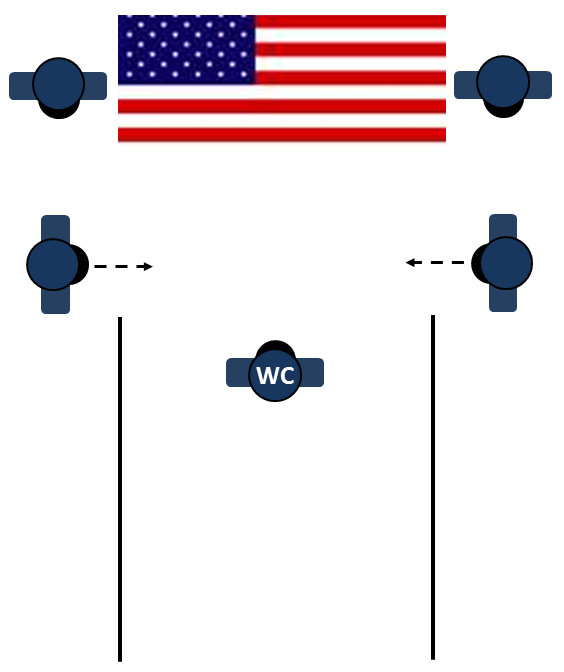 Within approximately four steps of the casket the WC gives the subdued command “Haaalt” on the left with another right step and close. All three automatically salute (with a three-second count up and down). Upon dropping their salutes, both watch guards then step off and move directly to their positions in the same amount of steps without flanking. When each guard arrives, they simultaneously execute a Three-Count About Face and remain at Attention. 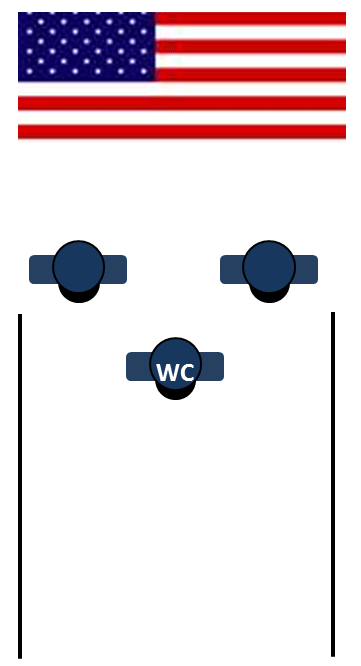 The WC executes a silent salute, executes a modified Three-Count About Face (“T”, “L” Step) and departs. The guards now go to Stand at Ease. The time between changes of the guard is entirely up to you. It is an honor to stand watch over a fallen comrade and as many who would like to should be given the opportunity. NOTE: When changing Watch Guards, the guards DO NOT salute each other, they are to only salute the flag/deceased. 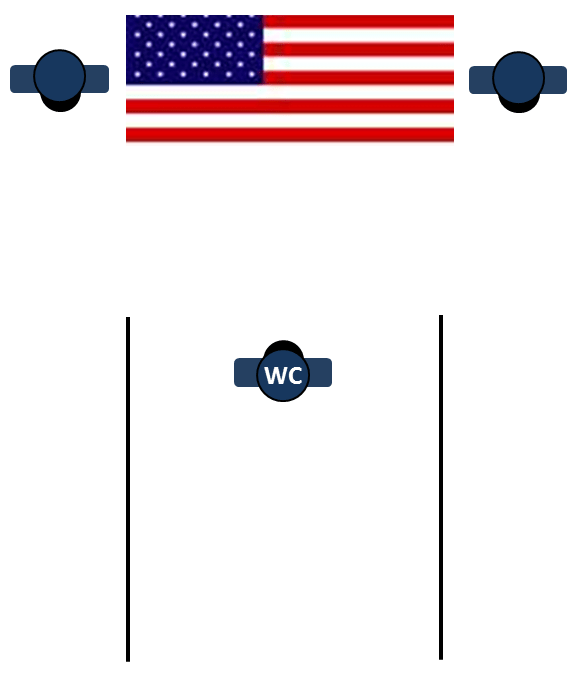 Within approximately four steps of the casket the WC gives the subdued command “Haaalt” on the left with another right step and close. When the oncoming team halts, the guards at the casket come to Attention. All three automatically salute (with a three-second count up and down). DO NOT SALUTE EACH OTHER, the salute is for the flag. The guards at the casket do not salute. 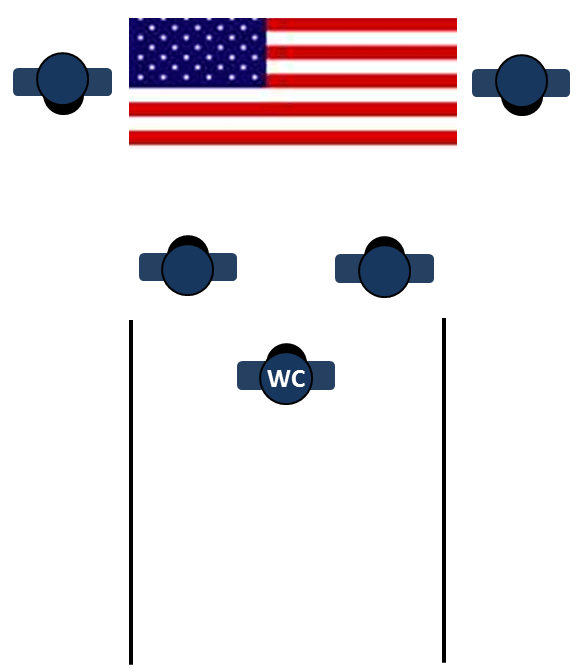 Upon dropping their salutes, all four guards exchange places in the same amount of steps without flanking and execute a three-count about face. 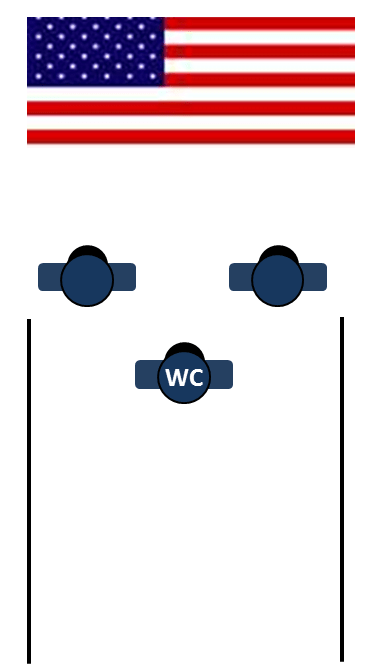 When all guards reach their spots, the off-going team salutes, and after dropping their salutes, simultaneously execute a modified Three-Count About Face (“T”, “L” Step) and depart. The newly placed guards now go to Stand at Ease. The Final Watch ceremony can be used before the pall bearers enter the room to retrieve the casket for transportation to the burial site. The WC enters the room and marches to a position approximately six paces from the casket and halts. Guards assume Attention. The WC renders the slow hand salute. 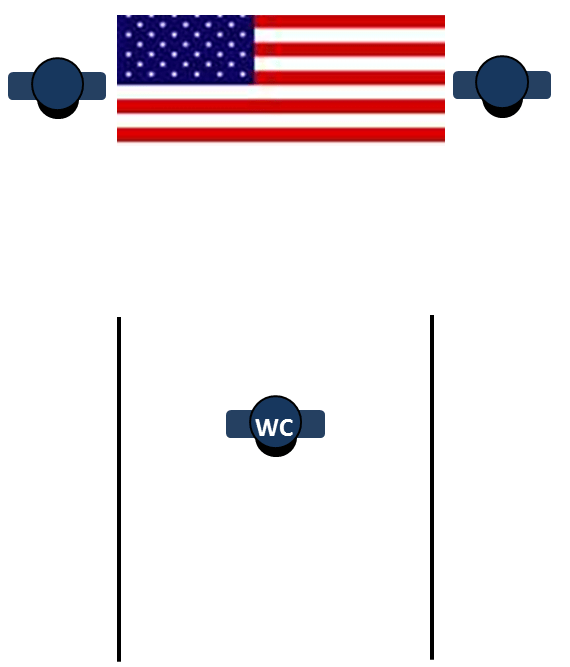 When the WC drops his salute, the guards come to Attention and posts in front of the WC to each side and all three execute a slow salute a modified Three-Count About Face (“T”, “L” Step) and depart. Note: An alternative to the above Final Watch change, is to have the final two guards switch to being pallbearers. They then push the casket out of the chapel to the other pallbearers who either join them or replace them. Does the Military Perform Casket Watch? The simple answer: it isn’t tradition for veteran funerals. The exception is in special circumstances like when a President dies and lies in state at the rotunda of the Capitol building. There is a joint service team that stands facing the casket off of each of the four corners. There is also an officer or NCO/CPO who stands at the head of the casket. The guards stand watch at Attention (they are armed with a rifle- not loaded and stand at Order) for one hour and are then changed. As the guards enter and exit they carry their rifles at Trail Arms, but at an angle, it’s more of a ceremonial look to this standard position. A group of ceremonial guardsmen from each service can rotate through a 24-hour period standing watch every few hours, it’s up to the ranking individual who stands at the head of the casket. There are also two more ceremonial guardsmen standing off to the side ready to move in if something happens to one of the guards. The Marine Corps does, on occasion, perform this duty with one or two Marines. “You must pin your free hand!” Not necessarily. In this picture below, a still from one of Adam Jeup’s (pronounced “jewp”) training videos, you can see that Adam has purposefully pinned his right arm while executing a rifle toss with his left. There is a reason he did this: “military flavor,” enhanced power to the toss, etc. Adam could have chosen to place his right arm at any point on the clock (let’s say 9:00) and the move would have been a variation and still looked good if he could keep his right arm steady in that position. He also could have kept it moving from the 6 o’clock position pictured to 12 while executing this movement: another variation- layered body movement under the rifle work. This is difficult stuff to do, though, and is for advanced Drillers who can easily manipulate the rifle and then create variations/other movements. The picture below, from army.com, shows the US Army Drill Team during their performance at the Joint Service Drill Competition probably in 2009. The point of the picture is to show you the free arms of three of the soloists. Do you see how they are in different places? They all should be pinned: it looks cleaner, keeps the “military flavor” theme that is the number one requirement for the service drill teams and also does not take energy away from the toss. Training, Practice and Rehearsal, three different types of well, practice. Here is an article on the Difference Between Practice and Rehearsal and an article on the Difference Between Practice and Training. Whether you are on a first responder or military honor guard or a JROTC/ROTC drill team, your responsibilities are the same to a point: develop your skills, keep them sharp and, if you can, learn new skills. You must cover these areas at drill team practice: Inspection, Regulation Drill and Exhibition Drill. There is one other area to cover whether drill team members or other cadets, color team (color guard). If the color team members are also drill team members then, obviously, you will have to have these cadets practice their sequence either on their own or for part of the drill team practice. Scheduling your time between platoon/flight and squad/element regulation sequences, then moving on to the exhibition sequence and even then working in color team(s) into the mix can be quite a challenge. Find out the layout of the next competition’s inspection area and work to enter and exit the area with the team. I remember when I marched on my JROTC team and we had a very small room (on purpose) for the inspection area. We marched 17 members with fourth squad entering first, then third, second, first and me last, the commander. The team formed up at the back of the room with just enough space for the judge to walk behind 4th element and we opened ranks perfectly and then it began. What I do not remember is how we exited. Practice marching into a small area/room by squad/element using “(Column of Files) File from the Right” command. We did very well my four years on the team because we had dedicated cadets and, what was even more important, we had dedicated instructors. Armed and unarmed platoon/flight and squad/element sequences can take the least amount of practice if you have created a solid foundation of drill and ceremonies in your JROTC program. 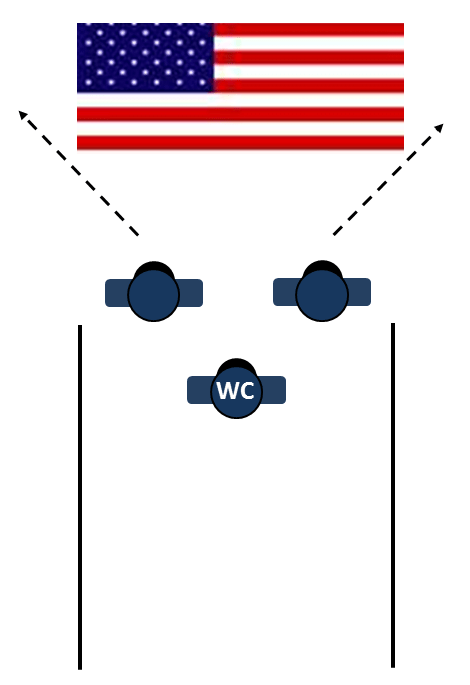 All cadets should at least be familiar with all stationary drill (standing manual), flanks and columns. Proper execution of each movement is key and then working on alignment and distance should follow. All team members should read applicable D&C manuals and the Commander(s) should eat, sleep and breathe the regulation sequence command list until it is completely memorized. The color team is part of regulation drill, but needs very specific attention. The uncase and case parts of the sequence must be accomplished per a mixture of the Army Training Circular and your service’s D&C manual. Yes, a mixture. Click here and read this article for a complete explanation. First responder honor guards need to practice their procedures for competitions and performances. This is also where that solid D&C foundation will help, plus personal practice time. Creating an effective routine takes time, teaching it takes time and, finally, practicing it takes time. All of the parts of a drill competition take a great deal of time and you must find a balance. If your teams practice for two hours every day after school, you will be able to find that balance with relative ease. If you practice Tuesdays and Thursdays for an hour-and-a-half, that balance will be more difficult- but it is doable. What do I recommend? Start early- even during the summer and teach new cadets all they must know for regulation drill to be perfect in their execution. Then, run through those regulation sequences twice a week to keep them fresh in everyone’s memory, with the rest of the time spent on exhibition. Lastly, give 100%, 100% of the time. Each time you practice make that practice seem like a performance on the competition field and be professional. If you can do your best with the resources you have and come in 8th place and still know that you gave your all, trophies will never matter.